We hope you’ve marked your sewing calendar to join in with our Swingset Skirt sew-along (November 9th-13th). 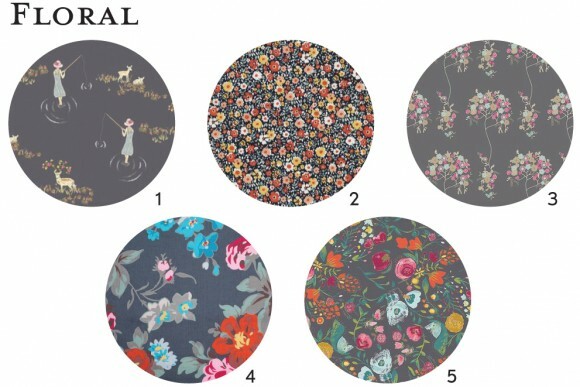 Come back here all next week when we will be introducing our sew-along panel. These talented sewists will be sharing their design decisions and fabric choices. Until then I’ve got lots of fabric, trim, and drawstring suggestions for you today so you can start planning and ordering your supplies. 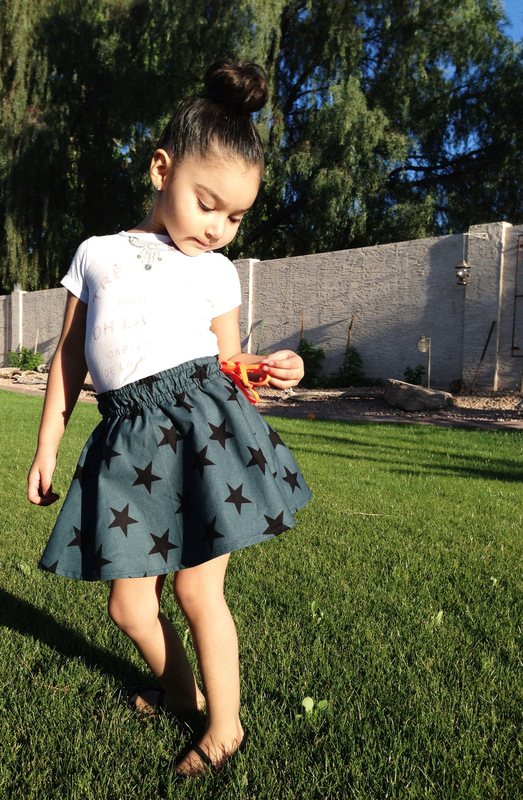 You’re ready to sew a spectacular skirt, but what fabric to use? The possibilities can be overwhelming. 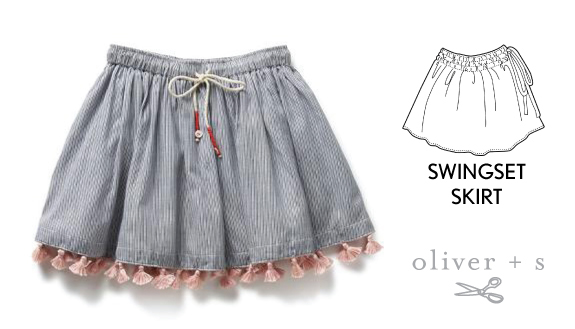 Many fabrics work well with this simple skirt: chambray, linen, quilting cotton, lawn, voile, fine-wale corduroy, gauze, sateen, Swiss dot. But what about prints? Polka dots work great as well as many others. I’ve gathered quite a few ideas here for you. 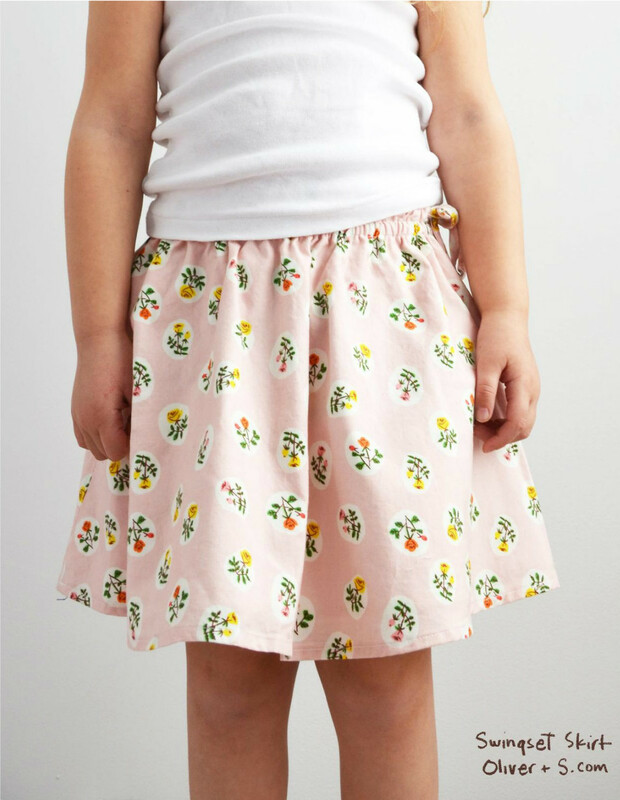 Tiger Lily by Heather Ross has become very popular and here is “Small Roses in Blush” sewn up in a Swingset skirt. 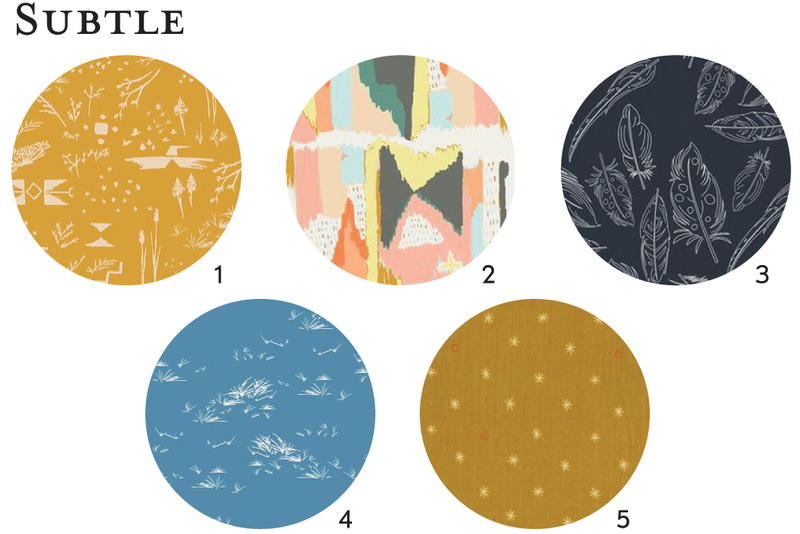 Here are some more fabric ideas for you in bright colors, some with faux stitching, florals, and then some that are more subtle. You can add some visual texture and interest with trims, including tassels, pom-poms and fringe. If you are looking for fun trims, try an Etsy shop like this or this. 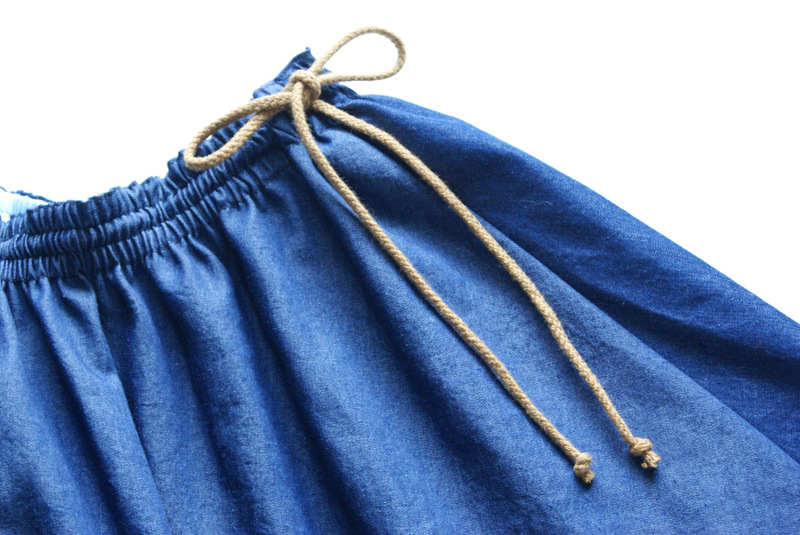 Have fun with the drawstring! How about one in neon orange? 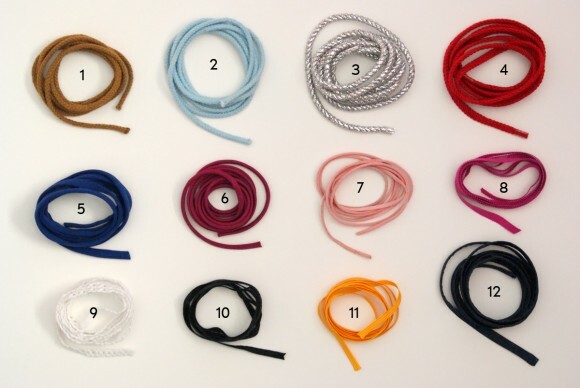 Here are a bunch of drawstring examples I’ve gathered for you. FYI all of these are 1.5 yards. I sewed a chambray (denim’s comfier cousin) skirt and paired it with a brown cord drawstring (#1 in the examples) and I really like the “denim and leather” look that it gives. Don’t forget you can make the skirt reversible by adding buttonholes on both sides for the drawstring. 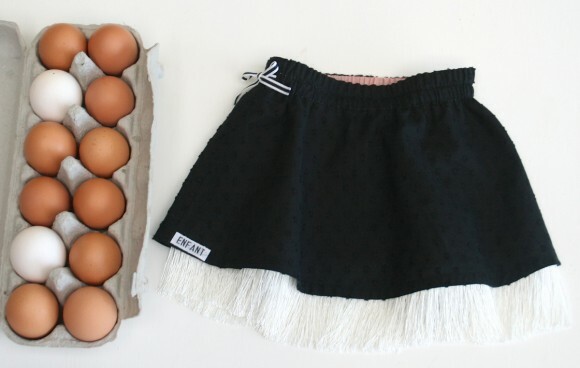 One last idea I had for you today is to make the skirt playground friendly by making Playtime Legging shorts to wear underneath. 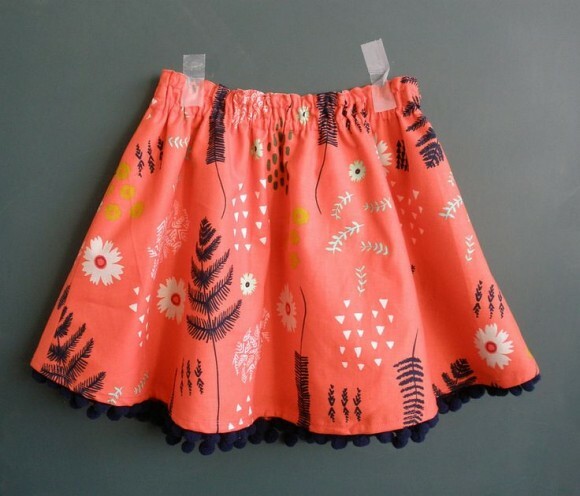 Or Seashore Bloomers for up to size 4. I’m certainly feeling inspired and I hope you are too. I’ll see you here tomorrow where I’ll be back to share some help on inserting drawstrings. 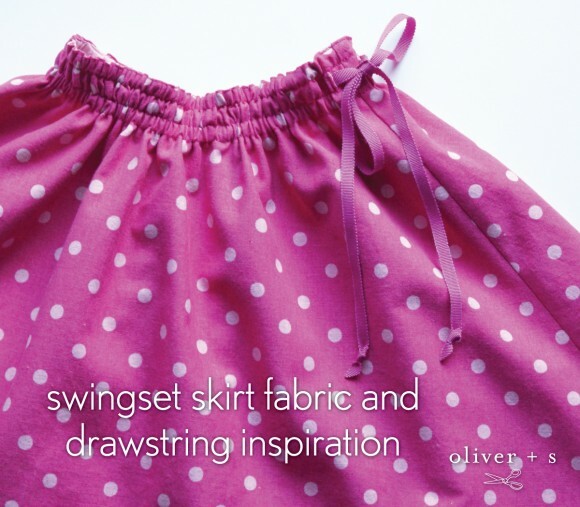 I recall a simple swingset skirt that had ceramic beads on the ends of the drawstrings. It was gorgeous and I’ve always meant to copy it!